CD20 (c terminus) antibody recognizes B lymphocyte antigen CD20, also known as B lymphocyte surface antigen B1 Bp35 leukocyte surface antigen Leu-16, membrane-spanning 4-domains subfamily, a member 1 CD20. The antibody has been extensively validated for western blotting using whole cell lysates. 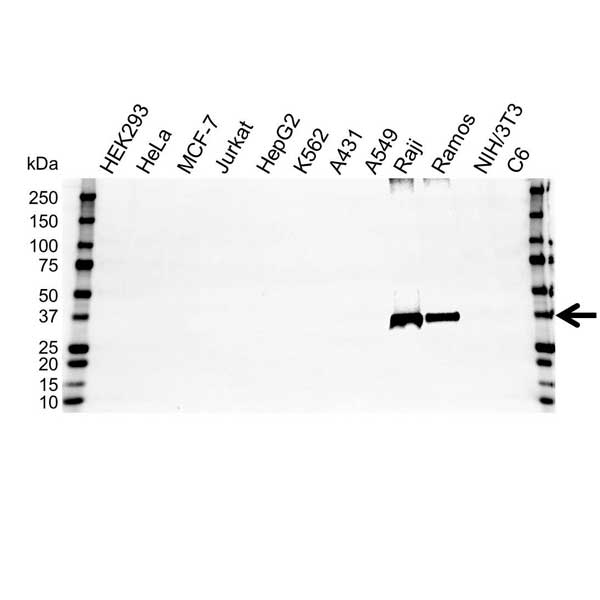 Goat anti Human CD20 antibody recognizes the B-lymphocyte antigen CD20, also known as B-lymphocyte surface antigen B1, Bp35, leukocyte surface antigen Leu-16 and membrane-spanning 4-domains subfamily A member 1. CD20, encoded by the MS4A1 gene, is a member of the membrane-spanning 4A gene family. Members of this nascent protein family are characterized by common structural features and similar intron/exon splice boundaries and display unique expression patterns among hematopoietic cells and nonlymphoid tissues. CD20 is a B-lymphocyte surface molecule which plays a role in the development and differentiation of B-cells into plasma cells. This family member is localized to 11q12, among a cluster of family members. Alternative splicing of MS4A1 results in two transcript variants which encode the same protein (provided by RefSeq, Jul 2008). Goat anti Human CD20 antibody detects a band of 33 kDa. The antibody has been extensively validated for western blotting using whole cell lysates. Anti CD20 detects a band of approximately 33 kDa in Raji cell lysates. Goat polyclonal antibody purified by affinity chromatography. Peptide with the sequence CQDQESSPIENDSSP from the C terminus of the protein.